Generating new knowledge is a relatively straightforward concept compared with the more unknown territory of getting knowledge to those that might need it. To ensure knowledge is useful, relationships must be built: two-way, long-term, trusting relationships between researchers and the people who need the new knowledge we are generating. Mark Reed and Anna Evely share their top five principles for effective knowledge exchange. Name an impact from research that hasn’t involved knowledge exchange. If like us, you can’t think of one, then it follows that if we want to have an impact, we have to become great at knowledge exchange. But what does effective knowledge exchange look like, and how can we get good at it? Three years ago, we set out to document the sorts of knowledge exchange being done across the UK, to find out what works. Our findings were published this week in Journal of Environmental Management, and in this blog, we’ll share with you five key principles that emerged from our work, as well as lots of handy tips for knowledge exchange, in the words of the people we interviewed. There are three reasons people commonly give for not getting their research to the people who might be able to use it. First, people don’t think they’ve got the skills or tools they need to engage effectively with stakeholders. Second, even if they know what to do, people don’t have the confidence they need to get their ideas out there. Third, people are under the (often wrong) impression that engaging effectively with stakeholders is time consuming and not of central importance to their research. We hope that with the rising importance of ‘impact’ in assessing research excellence in the UK, this third concern is becoming less important as engagement efforts are increasingly rewarded. But what are the skills and tools you need to make an impact? The circle above shows the themes about effective knowledge exchange that emerged from our analysis of interview transcripts. 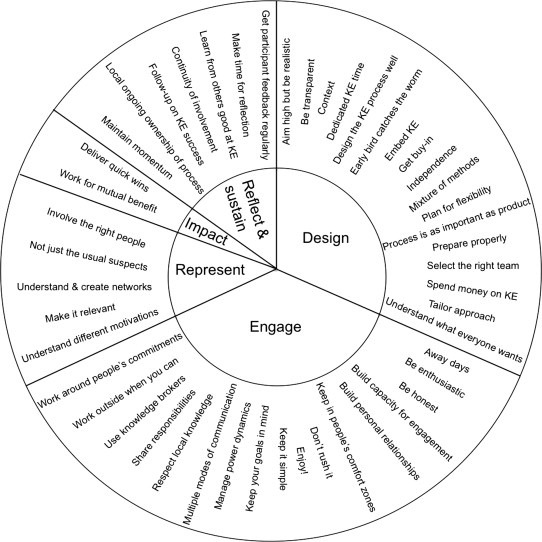 It shows how they map onto the five principles in the table below. Each of these themes are summarised in greater detail here, based on the words of those we interviewed. As researchers, we’re already in the business of generating new knowledge; it’s what we signed up for. But for that new knowledge to actually reach the decision-makers who might use it, they need to: 1) find out; and 2) understand the importance to them of what we’ve discovered. Traditionally, we’ve focused on how we can best make information about our research available and accessible. But even if we tailor information about our research really effectively to different audiences, they still have to actually learn from it, and appreciate its relevance to them, before it can become useful knowledge. Very often, that requires a significant level of active engagement, more than just disseminating information. To ensure this is useful knowledge, and has impact for those who need it, relationships must be built: two-way, long-term, trusting relationships between researchers and the people who need the new knowledge we are generating. As researchers have begun moving towards increasing impact, and building relationships to do so, we often hear great ideas and case studies about engaging with the people who might use our research from other researchers. Those ideas tend to range from the obvious (but we can’t believe we didn’t think of doing them already), to innovative, unusual ideas (that we can’t believe more people have heard of). For us, it was time to look at these ideas more systematically. We wanted to find out what researchers across the UK were doing, to improve our own practice, and of course so we could share them with you. We published the findings of our research this week (open access, of course), and we’d like to share our top five principles for effective knowledge exchange with you here. And, of course, in the spirit of knowledge exchange, if you’ve got ideas you’d like to add to this, please comment on this blog and share them with us. Table 1: Summary of principles for effective knowledge exchange including illustrative quotes from researchers and research users. You can read more about each of these themes in our new journal article in the Journal of Environmental Management. If you want to find out more about what it takes to be great at knowledge exchange, and gain confidence using these skills, check out the not-for-profit training we do, which is based on this research. So far we’ve trained researchers from >20 Universities and research institutes across the UK and in Europe, and have trained research managers from Government and the Research Councils. Our goal is to build capacity for knowledge exchange across the research community, so we can put our ideas into practice and be the change we want to be. This is an extract of a post from Project Maya and is reposted with the authors’ permission.